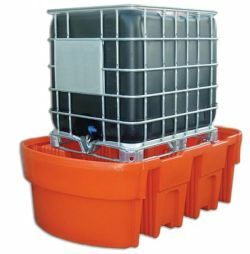 Bunded pallet 1050 L for IBC containers is made from MDPE. High durability is possible thanks to its construction that allows to prevent unnecessary leaks that might apper from IBC container. It’s also accessible by forklift. Easy to clean, 100% recycleable.